Oh snap! I went on a crazy sticker making spree! I'm super excited to finally reveal my new series of hand made art stickers. I have ramped up my experiments with making my own stickers ever since I created the Trollface sticker packets a while back. Trolls are cool and stuff, but they aren't my original creations... I seriously needed a way to show off my own art, too. So, I went back to my previous body of work, everything I've done over the past 10 years that was ever interesting or good, and dusted off an eclectic selection from my artistic career. Most of these pieces have been hiding on my ancient DeviantART account, back when I used to use that thing religiously. I soon discovered that some of these drawings were just made to be stickers. I hope that you guys agree! If you don't, then I'll have a lot of excess stickers on my hands. Stickers come in four different sizes, Extra small to Large (shown here for scale.) Some stickers are not readily available in certain sizes, but if you contact me I can gladly make up some customized sizes just for you. This strange looking girl was drawn with Oekaki. I really like her lips for some reason. She was originally going to be normal looking, but at the last minute I decided that it would be much more awesome if she looked like a possessed demon instead. Ain't she just the dickens? I have to admit that drawing morbidly obese characters is a secret talent of mine. This is an oldie but goodie, drawn in late 2004 on a group board (you can read more about these here.) I collaborated with another artist to create this image... 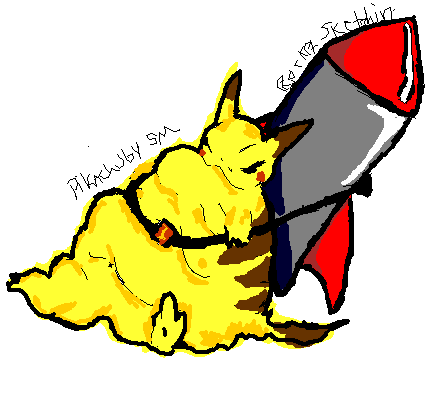 I drew the obese Pikachu and they drew the rocket. Because nothing's better than a morbidly obese Pikachu strapped to a rocket being blasted into space. I wish I could give the collaborator more credit, but I can't read their signature! Speaking of groupboards, this was a drawing I did on one roughly two years after "Obese Pikachu." As an artist, I really like being able to see my improvements in my technique over time. Both Pikachu and Smiling Woman are really cool as stickers in their own ways, but with this drawing I can definitely tell that there was an improvement in my drawing skills! Horray! Ahh, the infamous "Death's Designer Shoes" artwork has finally been made it into sticker form! Many will recall the tale of the original piece, it was stolen from me at a high school "open house." Well, the joke's on them because I still got a picture of it, and now it's going to be stuck to the side of trashcans by trendy vagrants everywhere. Another one of my more serious works that has been converted into sticker form. Why suffer the stink of real feet when you can have one of these adhesive-backed art prints instead? If you're curious about learning more about this particular art work, I covered it exclusively in this blog post. I just always thought this little Oekaki drawing was kinda cute. I was also obsessed with the Burberry brand at the time, thus the very trendy hat. For some reason I was really into drawing nekos, too. Oh well... my loss is your gain. They made my cousin throw away the original of this drawing once he was transferred, but this feathery legend still lives on. I think it will make my cousin very happy to hear that his Phoenix is still flying around out there, raising all sorts of hell, fire bird style. Can you tell that I'm a dog person? These are some digital painintgs that used real (famous) photographs as references. Well, they are mostly real. The needles may have been added in after the fact, but who can really tell these days? This is one of my newer works, some of you will recognize it from my "make your own canvases" tutorial. The sticker versions of this drawing look just like the original, except they're adorably miniature versions. Who doesn't need a tiny horny deer in their life? This sticker is a throwback to one of my favorite illustrative artists of all time, Tessa Stone. I admire her style greatly, and inevitably it showed up in some of my work. Why is his name "Andy" you may ask? Who is this person? Well, whoever he is, his name conveniently fills up that blank corner of the drawing. I have no idea where the original is, but somehow I still have photographic evidence of this weird little artwork's existence. It was a mix of watercolor, printing inks, and charcoal. RIP missing art work, you'll live forever in sticky form now! Look familiar? That chatter mouth thing really knows how to get around. This was a more serious piece, a still life. You can tell I was over-eager to go "all out" for this life drawing because of my use of that nightmarishly plaid fabric for the background. Why must I always make things so hard for myself? These Eskimos have definitely seen things. This design was one of the first I used to make stickers, way back when, even before my Trollface Stickers. I think I like these little guys solely based on the huge eyebrows of the 'Mo on the left. I bet they keep his face very warm during winter time. Now, you can take my teenaged angst with you wherever you go. This classic self portrait just oozes "tortured artist" realness. By the way, the tear means I've killed a man. I originally drew this space woman for a contest by Tessa Stone circa 2009. The assignment was to illustrate a song from a list of Tessa's choosing. I chose the song "Sincerely Me" by Better than Ezra. It was about a guy that was writing to a girl that had left him for a far away land.... in this case, she went all the way into outer space just to avoid him. Space Ghost looks like he is having a bad day. Or perhaps his stomach hurts because he took such a huge bite out of his note card. I made this drawing into a sticker because I adore Space Ghost Coast to Coast... that show brings back so many good nostalgic childhood memories for me! Studio Art Stickers- "Seis Face" and "Ten Chins"
Who knew that you could translate fiber art into sticker form? These two artworks were originally a part of my AP Studio Art portfolio in high school (you can read all about it, here.) I really like how colorful these guys turned out, you can definitely taste the rainbow. I was totally into YOLO-ing before it was cool. This is a self portrait I did around 2009... here I am sailing the seven seas in my cardboard box of imagination. Don't I look so happy? I don't do this style very often, but I am kind of digging it. Reminds me of illustrations for a story book or something. All of these stickers were painstakingly hand made by me. I didn't print them out on adhesive paper, I personally added industrial strength double stick tape to the back of each and every sticker instead. This took me forever to do, but it was worth it. In my opinion, I think that using this special tape adds a lot of value to my customized stickers. They're seriously serious about sticking to things! Some artists believe that "you are only as good as your latest work," and I agree with this to an extent. But on the other hand, there have been so many pieces that I've done in the past which have truly been sheltered from the world. Is it still considered old work if it's new to everyone else? My answer is, I don't care cuz I'm gonna do it anyways. By the way, I have some new envelopes in the works for these stickers, similar to the ones for my Trollface packets. If you buy in bulk you'll definitely be getting your stickers in an awesome pocket keepsake. More pics to come soon... stay tuned! Had to buy more. My girls were fighting over them.